The drilled hole in its hull patched, Russia’s Soyuz MS-09 spacecraft, currently attached to the International Space Station, has been authorized for further flight and re-entry as a rescue capsule, which will take the space crew back to Earth if need be, the manufacturer, space rocket corporation Energia, said after a meeting of the council of chief designers. 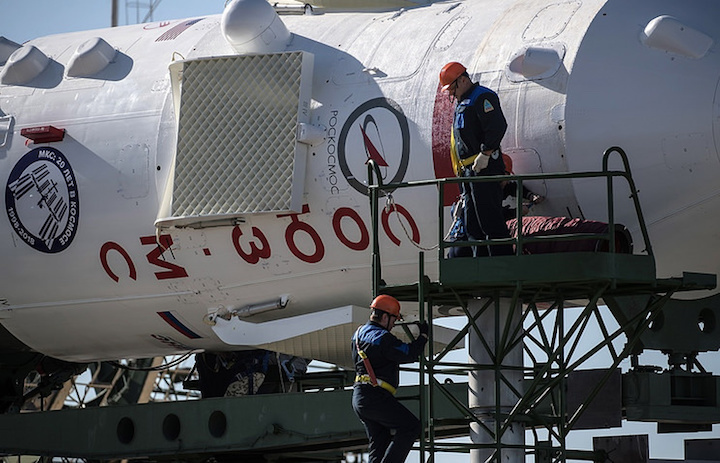 "The manned spacecraft Soyuz MS-09 has been authorized for further flight as part of Russia’s segment of the ISS and for being used as a rescue capsule," the company said in a news release. As the Energia corporation’s deputy general designer Vladimir Solovyov said at the meeting, the air leak had been eliminated and standard pressure restored. The chief designers’ council met on Tuesday. A drop in air pressure on board the ISS occurred on August 30. It was soon found out that the air was escaping through a tiny two-millimeter hole in the hull of the Soyuz spacecraft attached to the ISS. After several days of analysis specialists arrived at the conclusion the hole had been drilled from the inside. The chief of the Roscosmos corporation, Dmitry Rogozin, said the incident turned out far harder to investigate than it had been originally anticipated and the corporation’s specialists still had no objective picture of what happened and how. He added that "competent agencies" were participating in the probe.